[x]Ref picture is a must have. [x]Due to recent events, I now ask for full payment up front before I start. Other than that, give it a shot. If you need a specific example of something, let me know and I'll go look in my gallery. -Pokemon Additions - +550pts/5.50USD(Base Price) Depending on Pokemon size and complexity, it may go up. -Please give me a small personality blurb for a pose or it will be left up to me. -Price may increase depending on the complexity of the character. -Photos provided need to be either free-use/public domain or preferably photos you've taken yourselves. -If found image. Photographer's name must be provided and it can't be under a non-commercial license. If both are not provided or within guidelines, I can not use the photo. 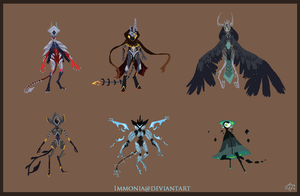 Sheets of 6 random adoptables. Please mention if you would like a certain species. You may lists dos and don'ts. If paying in points: An additional 500pts are required to make up for the 2 week DA clearance period that I have to wait to access those funds. This type I work with you to make a design. There is a 4 revision limit until additional payment is required. Extra work and payment will be discussed at the time of additional changes. Price will differ depending on the work wanted. An additional 500pts are required to make up for the 2 week DA clearance period that I have to wait to access those funds if you pay in points. Hi! Could I get another MSP flat for Caius toyhou.se/1159744.caius ? I'd like to pay via points(2500)! Sure can. Please send the points through my commission payment widget located on the front page of my main gallery. Great, payment received. I'll go update my work list. Should be able to start either tomorrow or the day after. could i get a design sheet in usd? Sure thing. Can you note me your paypal info so I can send you an invoice? can i commish a MSP flat of my new chitter toyhou.se/1484826.-suncore- ? I've got another commission ahead of you so I should be able to start maybe tomorrow or the day after depending on my work schedule. hi hi! can i commission an MSP flat of toyhou.se/3094061.arian#106916… ? ohh you got another chit. Yeah I'll send you an invoice in a sec. yeah i couldnt resist, haha! I should be able to start later tomorrow. Can i commission a MSP flat of toyhou.se/3084504.-kandee-#106… ? anything with jumping/ floating / maybe giving some nostalgia vibes? Should be able to start and possibly finish today or tomorrow. Heya. can i get a chibi? Sure can. Points or paypal? Can you note me your PayPal info so I can send you an invoice? could i get one design sheet with usd? if possible, i'd love to have the armour/base colour be a different hue than the accent/energy colour, so e.g. grey and purple! preferably all humanoid, tails/wings can be added if you feel like it fits!! Can you send me your paypal info in a note so i can send you an invoice? I don't get asked to do them often but I can depending. I just charge the price of two flats for two characters in the same piece. I'd be interested in getting more masked space dragons. Would this be too specific for a design sheet commission? Were you thinking about getting the batch of 6 random ones or the single? They wouldn't have to be the same species has these two! Cool, yeah I can definitely do that. I'll go update my work list. I should be able to start today and finish within 3 days. i would like a custom zippercat ! cityvampire will be paying, he can confirm in the comments!" then he will accept as soon as he gets online. Great, I saw the confirm. Can you note me what you were looking for in your custom? Great, I'll send you an invoice. Hellooo! If its possible, could I buy a zippercat custom from you? Sure can. Customs work like my normal design customs. They are 45USD a piece. If you're still interested note me you paypal info so I can send you an invoice. can i commish a custom zippercat? cityvampire will pay with his paypal since i dont have one myself, he will confirm in the comments! Great, I saw that city vampire confirmed so I'll send them the invoice. What were you after for concept? You can comment here or note me details. can i commission another MSP flat of toyhou.se/1973959.-kisu-#69620… ? Commissions price list (CLOSED)Btw, these might close pretty soon, because i'm not taking more than 6 comms at a time. Commission prices [closed]I MOVED TO nyaantaro !! PLEASE WATCH ME ON nyaantaro IF YOU WANT TO COMMISSION ME, THE SAME JOURNAL IS ALSO ON THE NEW ACCOUNT ! Please read everything before commenting!! ✧ If you want to commission me, comment on this journal. Please do not note me. ✧ Please fill out the form at the end of this journal or include every information in your comment. ✧ You need to pay before I start your commission, unless I say otherwise. *Updated the example for head shot. Sorry about that. Haha. Commission for waist up is currently open: 4$ per character. Commission Information **CLOSED**Welcome to my commission information! I'm so happy that you might be interested in commissioning me and I look forward to see a note from you in my inbox. Please make sure that you read all the information in this journal, and if you have any questions - just ask. To see my previous commissions, follow this link! Feel free to take a look at the rest of my gallery to see other stuff I've made. 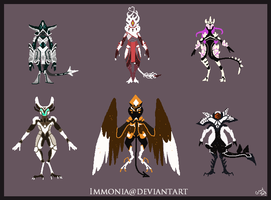 Contest: Design Me a Character ($100+ in prizes)So after some deliberation [with myself], I've decided to host a character designing contest. I've recently been in design exchanges, but I'm just not finding a character I really connect to that I want to keep on my main cast. I'm hoping something like this will end up leading me to have some new OCs that I can for sure use and cherish. I'm honestly not sure whether I want another humanoid or feral or anthro character, so I'm creating two categories: a human/humanoid category and an anthro/feral category. Pixel Commissions [ALWAYS OPEN]EDIT: Will be open indefinitely regardless of queue just please allow me time!!! I have a life aside from art and sometimes I work slowly. All funds will be going towards my hormone therapy treatments. Tips are highly appreciated! Hey guys! These are back up. Comment below with this form filled out to order! Details: larger, more detailed full-bodies - lineart/shading styles may vary. size is about 800-1000 px. Details: less detailed, quick full-bodies. size is about 500-600 px. can pick between lineart highlights or not. Details: exaggerated features, especially leg-wise. size is about 500 px.